After sitting in bumper to bumper traffic for a solid half hour, it was clear that my dreams of kicking it with carnies and eating deep-fried White Castle burgers at the L.A. County Fair had to be reassessed. Of course I was looking forward to the smelly petting zoos and dizzying Tilt-a-Whirls, but wasting a beautiful summer afternoon idling on the freeway wasn’t in the cards, so I did what I had to do. “There will always be next year,” consoled The Astronomer. With Plan A kicked to the curb, we moved on to Plan B—cruising for grub in the San Gabriel Valley. 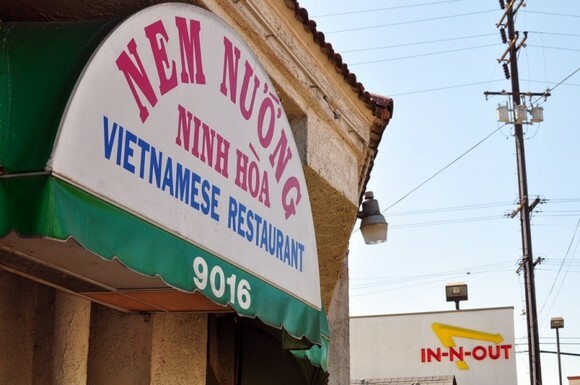 Twice in the past week, I’ve received recommendations for a Central Vietnamese restaurant in Rosemead named Nem Nướng Ninh Hòa. “It’s one of the best,” said Hong, one half of the Ravenous Couple. “It’s in my top three and I’ve been going here for years,” said Wesley, one half of the Two Hungry Pandas. After confirming the address with yet another Panda, we made our way to Nem Nướng Ninh Hòa in time for lunch. The restaurant was operating at full capacity when we arrived. After placing our names on the waiting list and moseying around for fifteen minutes, we were seated at a table for four. In between placing our orders and the food arriving, I felt a tap on my shoulder. “Are you The Gastronomer?” asked a friendly looking gentleman. “And you’re The Astronomer!” he said while pointing at Vernon. I can’t remember whether or not we actually confirmed our pseudonyms, but we did invite him and his friend to join us. Surely, it was the least we could do for the first readers to spot us out in public! 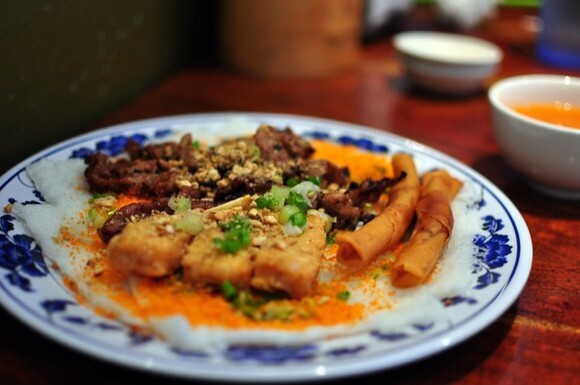 We started off with an order of banh beo ($5.49), a dish from the city of Hue. The twelve steamed rice cakes arrived in shallow porcelain dishes piled atop one another. Each cake was sprinkled with dried minced shrimp, smeared with scallion oil, and finished with a crisp “crouton” of rendered pork fat. To eat, we spooned a bit of sweet fish sauce atop the warm banh beo and dug in with spoons. Once while visiting Hoi An, The Astronomer and I ate banh beo using flat wooden sticks! The steamed rice cakes were doughier and less pliable than the ones we enjoyed in Vietnam, which surprisingly bothered The Astronomer much more than me. I love how my boy’s become a Vietnamese food snob. Next to arrive was the house special, a selection of Ninh Hòa-style grilled pork meatballs and skewers ($14.99). In the great tradition of Vietnamese do-it-yourself dishes, theproteinwas accompanied by rice paper and a forest of greens and herbs for garnishing and wrapping. A curiously goopy orange sauce (tuong nep)was served on the side for dipping. The bevy of meats included nem nuong (sweet pork skewers and meatballs), nem cap (pork patties wrapped in banana leaves), nem chua nuong (sour pork patties), and cha ram tom (shrimp egg rolls). The classic nem nuong were my favorite, although the others weren’t very far behind. I skipped the strangely sweet orange sauce and dipped my rolls in nuoc mam instead. My favorite dish of the afternoon was the banh hoi ($8.25). The woven mats of rice noodles were topped with thit nuong (grilled pork), tau hu ky (shrimp cake wrapped with bean curd), shrimp egg rolls, scallion oil, and a smattering of dried shrimp dust. The texture of the banh hoi was just about perfect, soaking up the nuoc mam like a gauzy sponge. Lovely photos. 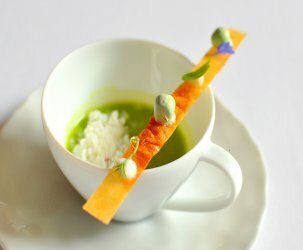 Someday I hope to share a Vietnamese meal with you! glad you enjoyed it! that “strange goopy sweet orange sauce” is their copy of the famous and delicious Brodard sauce which inspires a lot of imitators. not sure why, but i’m guessing as a kid maybe i didn’t fully appreciate nem nuong. so now whenever i try and convince my parents to go with me to a restaurant to eat it, they always seem to brush off the idea (or when i ask my mom to make some). i tell you what though, there are days where i’d rob an old lady for some banh hoi, but i prefer mine with thit heo hue (crispy pork). great stuff. 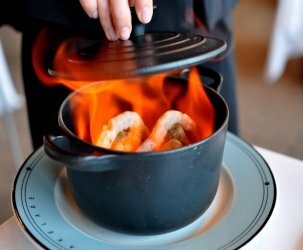 OMG, I love this restaurant! I go whenever I’m in Cali! We order a ridiculous number of banh beo. 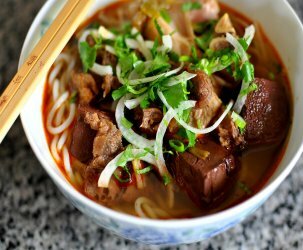 I wonder if I’ll be snootier about Viet food now that I’ve spent time in Vietnam. Can’t wait to stop there in April! Check! On the list for January. Thank you. I love that you were recognized. It has happened to me twice — once at a wedding and once at Rite-Aid. 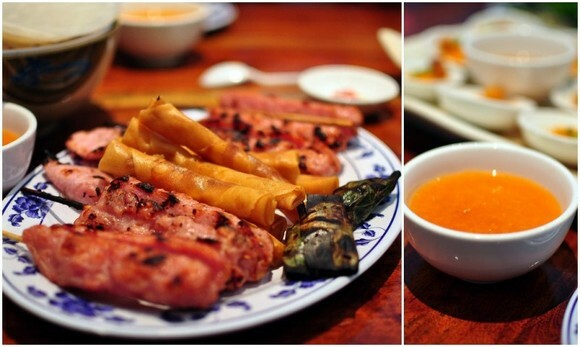 The curiously goopy orange sauce is what makes it from Ninh Hoa, rather than nem nuong from anywhere in Vietnam. Having eaten at neither Nem Nuong Ninh Hoa or Brodard, I can’t say how either of their sauces are. But based on the photos alone, Brodard’s does look like what I’m used to. 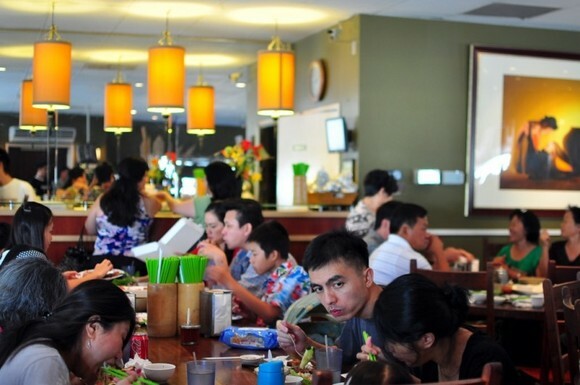 I need to travel down to the SGV one of these days… so many delicious sounding restaurants! Dang, I haven’t had oatmeal in months and was looking forward to it but why did I click over here first? delicious looking fingerfood! I’m sorry you missed out on the fair! Yum! 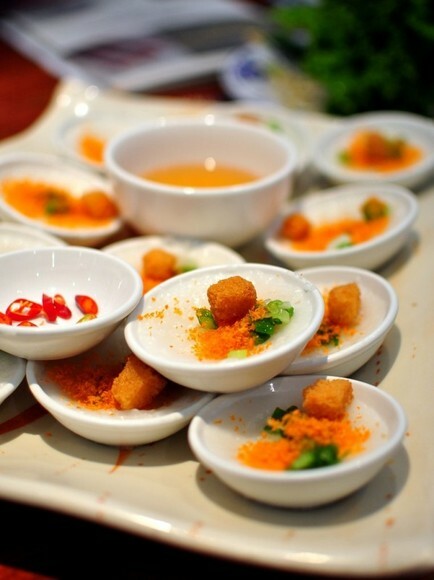 Those banh beo are presented in such an interesting fashion. Too bad the texture was off! It was EZ to guess you were the Gastronomer – that huge camera gave it away, despite your disguises! You make a beautiful & handsome eating couple. Bring back some leftovers from NY. Come to our side of town and we’ll show you around! How do you think one becomes a rice noodle mat weaver? That would be an interesting job, doncha think? my mouth. it be drooling. the end. That strange orange sauce is delicious. I’m glad you like the food there. and… wow. You are a natural at photography. Great work! I love, love, love this place. It’s my favorite restaurant! I enjoyed the texture of the banh beo. It’s especially soft when it comes out really hot. Ah, I need to go back here pronto. Thanks for the review. Great pics. 🙂 Where would you recommend for the best Banh Beo in LA/OC? Thanks.